The Town of Kirkland deploys every summer throughout the municipality its environmental awareness patrols to remind its citizens to behave in a more eco-friendly way. 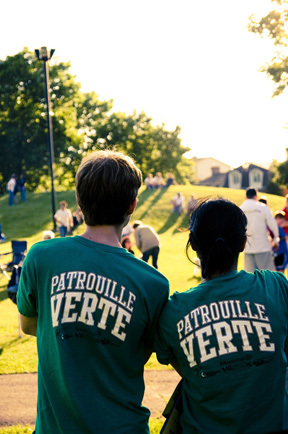 The environmental patrols are made up of students and are divided into two categories: the Green Patrol that deals with current environmental issues and the Blue Patrol mainly assigned to water conservation. These patrols will be going from one event to the other, walking or biking through the streets of Kirkland and will hold various booths, especially in day camps, to promote good daily practices as well as the town's environmental programs. The patrollers will be coming up to citizens and encouraging them to change their consumption behaviours and to make informed decisions when purchasing certain products. Composting, smart use of drinking water, rain water barrels and energy efficiency are only a few examples of the issues that will be raised. Unlike city inspectors, patrollers are not authorized to issue fines. This summer, take a few minutes to listen to what they have to say and become eco-friendly citizens!